At Lelander, we are serious about creating quality software. Our developers are always learning, and always testing their own assumptions. We are a casual, friendly group of professionals. Not stuffy. Not pretentious. We take pride in what we do, without a prima donna attitude. Lelander embraces geekiness. We are constantly consuming and processing through technical content, going to conferences, reading books, attending and speaking at local tech meetups. It turns out that artists, philosophers and poets are finding creative solutions with code. Many Lelanders came from disciplines in the Arts and Humanities. Collectively we have a long history on mobile platforms. We have explored many paths to creating great mobile experiences, and you get the benefit. Our combined list of known languages looks like Klingon to the layperson, yet we learned our P's and Q's from our mothers and also have good manners. My company needs development services Mobile app development, user experience, custom web applications and solutions consulting are all within our wheelhouse. Call to see how we can help. I work at an agency and we need to outsource Clients are known to ask the impossible, and leave it up to you to figure out. Lelander can work with you to find the right mix of talent and creative solutions to impress their CMO. I'm a freelancer and I'd like to partner up Want to work with someone who values your talents? Like working for yourself, but looking for a little more stability? Do you miss working on a team since going solo? Send us a resume or a link to your portfolio. Let's talk. We are an independent St. Louis web development agency founded in 2004. We believe Diet Coke is a breakfast food. Citygarden has the highest standards when it comes to clean, beautiful design, and elevating art. When it comes to the highest quality experience for mobile, you have to go native. We built an engaging iOS application that uses GPS to help you drive and park near Citygarden. Upon arrival, the app follows you through the park, and gives you a self-guided audio tour of the artists and sculptures as you amble through it. We even track food truck tweets in case you're hungry at lunchtime. 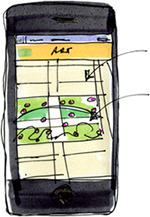 Lelander created high-level sketches of the app in order to explore key functionality requirements prior to beginning the prototyping phase. We've worked with some pretty cool companies along the way. Are you next? Get in touch. © 2013 Lelander. LLC. All Rights Reserved.